Religion always has to interact with the assumptions of the cultures with which it deals. To understand an ancient religion like Christianity (and Judaism, on which it is based) it is essential that we know the “ancient and medieval world views” that were prevailing when its sacred scriptures were written and its basic theology was developed. The documents shown here help to explain the cosmology of those days, the things that may seem strange to us but which everyone assumed without question at the time. An excerpt from Augustine of Hippo’s The City of God concerning the topic of astrology. Augustine uses the issues of twins to criticize astrology from a practical standpoint, but he also attacks astrology from a theological standpoint. This excerpt has been selected by the Interdisciplinary Encyclopedia of Religion and Science (Inters.org), which is edited by the Advanced School for Interdisciplinary Research, operating at the Pontifical University of the Holy Cross, Rome, and directed by Giuseppe Tanzella-Nitti. Click here for Augustine’s critique, from Inters.org. Click here for Augustine’s critique, from The City of God (book V), from the full text available via Google Books. Anselm of Canterbury (1033-1109), often called the Father of Scholasticism, was born in Aosta, in the Kingdom of Burgundy. Today Aosta belongs to Italy, specifically to the region of Val d’Aosta. Anselm later became prior (1063), and then abbot (1078), of the Monastery of Bec-Hellouin in Normandy, France. In 1093 he was consecrated Archbishop of Canterbury in England. As an intellectual, he is known above all for his three works the Monologion, the Proslogion, and the Cur Deus Homo. Nicholas of Cusa (1401-1464), sometimes misleadingly referred to as the first “modern” philosopher, was born in Kues, Germany (today Bernkastel-Kues). He became a canon lawyer and a cardinal. His two best-known works are De Docta Ignorantia (On Learned Ignorance) and De Visione Dei (On the Vision of God). Click here to reach the full source page with links to many of their writings, at: http://www.jasper-hopkins.info/. A version of this essay appear as part of Fr. Coyne’s essay “Evolution and Intelligent Design: Who Needs God” in Divine Action and Natural Selection: Science, Faith, and Evolution (World Scientific, 2009). 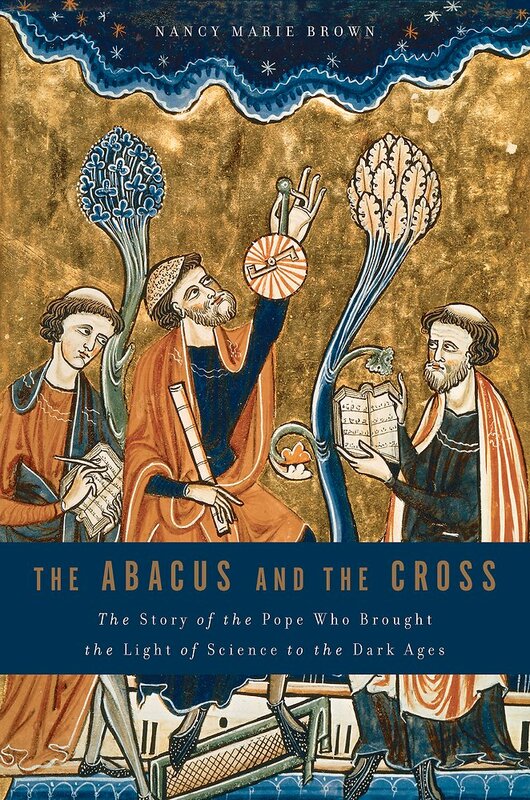 The Abacus and the Cross is a book with a hero and a villain. The hero is Gerbert of Aurillac, the 10th century shepherd boy who became monk, schoolmaster, scientist, mathematician, and abbot, and then reigned at the turn of the first millennium as Pope Sylvester II. Gerbert was the first to introduce Arabic numerals to Europe, using them on his abacus; he wrote a leading textbook on geometry, which was supplanted only after 200 years when full translations of Euclid became available in the West; and he constructed and used astronomical instruments such as armillary spheres and astrolabes. Little remains of his own writings. Evidence for his genius can be inferred for the most part only indirectly, by examining how his knowledge spread to his students. His achievement is also complicated by his popular reputation as a “devil’s tool” and master of dark arts – which Brown insists is inaccurate and unfair. “Brown’s style is more Abbo than Gerbert. She capably synthesizes other scholars’ evaluations and translations of the primary source materials, but the ample notes at the end of the book do not give evidence of direct work with primary sources from Gerbert, Abbo, or their contemporaries. Brown compensates for the lack of documentary evidence concerning Gerbert’s life by describing in substantial detail what life would have been like for someone like Gerbert. This includes detailed notes on the typical diet, style of life, and pattern of education of a monk; the manufacture and use of parchment, paper, and ink; the construction and use of books; and the processes and dangers involved in travel. Her summary of Gerbert’s accomplishments in mathematics and science whets the appetite, but will not satisfy a reader with some scientific background. Brown describes what Gerbert could do with his abacus and other instruments, but she does not discuss in any detail how he could do these things. Her outline of Gerbert’s political entanglements and his ascent to the papacy will be difficult to follow for a scientifically-minded reader without a background in turn-of-the-millenium history and intrigue. Brown’s account is more about what happened (with many names and dates) than about why. Most frustrating is Brown’s account in Chapter 9 of a “figurative poem” which was written by Gerbert. Brown communicates that this was an extraordinary accomplishment, marvelously complex and well worth exploring, but she does not help her reader to enter into the poem and its complexities in any serious way. Brown sets the table, but she does not serve the meal. Three themes run through this book. First, Gerbert’s work in mathematics and science serves to show that the Dark Ages weren’t all that dark: creative things were happening, knowledge was advancing, and math and science were already rational and experimental. Second, science and religion are not (and were not) really at war; Gerbert himself is an important example of a religious person who also did first-rate work in mathematics and science. Only much later did Petrarch, Washington Irving, William Whewell, John Draper, and Andrew Dickson White construct the whiggish notion of an eternal war between science and religion, by circulating the charge that religious people persisted in the uncritical belief that the earth is flat, not round (a version of history that Brown goes to great lengths to refute). And finally: if only Gerbert’s hopes and ideals had been realized, history would be different: religion and science would be one, and science would bridge the tensions and differences that separate Christianity, Islam, and Judaism. But Brown displays a whiggish tendency of her own. She accepts and employs without critical comment the Enlightenment notion of science as an enterprise that is straightforwardly and simply rational and experimental. This book represents an intellectually honest, good-faith effort to portray Gerbert and his accomplishments at a popular level. But both scientifically and theologically minded readers can only echo her own plaint of “what-if.” If only she had gotten inside the scientific issues. It would have been fun, for example, to hear in some technical detail how Gerbert’s Abacus actually worked, or for that matter how his “figurative poem” played out on multiple levels of meaning. Or if only she had gotten inside the theological issues. It seems strange for a book concerned with debunking the notion of a “war” between science and religion to take no account of theological issues. But Brown deals with religion only as an institutional and sociological force; in this book, the only place the Cross shows up is in the title. Click here to read the full article at: http://iopscience.iop.org/article/10.1088/2058-7058/24/10/38?fromSearchPage=true. The Irrational Augustine takes the notion of St Augustine as rigid and dogmatic Father of the Church and turns it on its head. Catherine Conybeare reads Augustine’s earliest works to discover the anti-dogmatic Augustine, who values changeability and human interconnectedness and deplores social exclusion. The novelty of her book lies in taking seriously the nature of these early works as performances, through which multiple questions can be raised and multiple options explored, both in words and through their dramatic framework. The theological consequences are considerable. A very human Augustine emerges, talking and playing with friends and family, including his mother – and a very sympathetic set of ideas is the result. Click here for a preview, available from Google Books. In this series of posts, written for The Catholic Astronomer blog, Christopher Graney discusses “Two Spheres Theory” regarding the shape and composition of the Earth. The Two Spheres Theory was a medieval idea that came to be taken as scientific evidence for existence of, and direct action in the world of, God. However, the Two Spheres Theory was soundly disproven by, among other things, Christopher Columbus’s voyage to the lands now known as the Americas. Click here to read Part I of this series on The Catholic Astronomer – the blog of the Vatican Observatory Foundation. Click here to read Part II of this series. This newly revised edition this accessible and enlightening book by Professor Michael J. Crowe of the University of Notre Dame (USA) recreates one of the most dramatic developments in the history of thought: the change from an earth-centered to a sun-centered conception of the solar system. Written in a clear and straightforward manner, the work is organized around a hypothetical debate: Given the evidence available in 1615, which planetary system (Ptolemaic, Copernican, Tychonic, etc.) was most deserving of support? Beginning with an introductory chapter on celestial motions, Dr. Crowe proceeds to a discussion of Greek astronomy before Ptolemy, mathematical techniques used by ancient astronomers, the Ptolemaic system, the Copernican and Tychonic systems, and the contributions of Kepler and Galileo. In an epilogue, quotes from writers, philosophers, and scientists reveal the impact of Copernican thought on their work. Easily within the reach of anyone with a background in high school mathematics, this absorbing study offers a sound introduction to our solar system and an opportunity to relive one of the most momentous periods in intellectual history. Click here for information from the publisher, Dover. When speaking about light, faithful to his method, Thomas Aquinas’ starting point is terminology: he wants to clarify the use of the word “light” in all its different meanings, hoping to avoid misunderstanding, and this offering us a lesson in a scientific method which seems particularly valid even today (see a.1). Properly speaking, the original meaning of the word “light” is “something” that makes it possible to see, whereas in another, more analogical, sense, “light” can mean “something” that makes it possible for the other cognitive faculties to obtain the sort of knowledge that is proper to them. The first meaning goes back to the ambit of interaction with the senses, on a physical or material level; the second, on the other hand, analogy brings us into the immaterial ambit of knowledge. Thomas skillfully maintains our attention, for now, on the essential elements of the matter, avoiding getting into a physical theory of light which he deems unnecessary for this initial terminological clarification. Click here for Thomas’s discussion, from a preview from Google Books of the Summa. One of the first people to develop something like the modern (Newtonian) scientific theory of motion was John Philoponus of Alexandria, who lived in the sixth century. This brief excerpt from the on-line Stanford Encyclopedia of Philosophy introduces Philoponus and his ideas about impetus in physics. Click here to access this article directly from the Stanford Encyclopedia of Philosophy. Translations of Philoponus’s work on physics and Aristotle are available from Bloomsbury Publishing. Click here for information from Bloomsbury. Click here for information from Google Books. A post on The Catholic Astronomer blog by historian of science Christopher Graney. Graney points out that the idea of an immense universe is not merely a concept of modern science, but can be found also in ancient cosmologies, for the idea follows from basic observations of the sky. A post on The Catholic Astronomer about St. Albert the Great and his thoughts on the nature of the universe of stars. A post by Br. Guy Consolmagno, S. J., of the Vatican Observatory, on The Catholic Astronomer website examines the suggestion that the conversion experience of St. Paul was actually triggered by the fall of a meteorite, and the fallacy of forcing material explanations for subjective but real experiences. And You are the being who exists in a strict and absolute sense because You have neither past nor future existence but only present existence; nor can You be thought not to exist at any time. And You are life and light and wisdom and blessedness and eternity and many suchlike good things; and yet You are nothing save the one and supreme good, You who are completely sufﬁcient unto Yourself, needing nothing, but rather He whom all things need in order that they may have being and well-being. Click here for this material from Inters.org. Click here for this material from a published edition of Anselm’s works. Was the Bible Meant to be Taken Literally? This excerpt from a longer interview in 2008 features Br. Guy Consolmagno, S. J. of the Vatican Observatory discussing the question of taking the Bible or other texts “literally”. Click here for information on the full interview. “We saw his star in the east”. On the feast of Epiphany, Fr James Hanvey SJ travels to the Pope’s summer palace outside Rome, home to the Vatican Space Observatory, to explore how God can speak through space and science. Preacher: Dr Guy Consolmagno SJ, Chair of the Division for Planetary Sciences of the American Astronomical Society and planetary scientist at the Vatican Observatory. This program first aired on BBC Radio’s Sunday religious program for Epiphany. This program, hosted by Fr. James Hanvey, explores the meaning of Epiphany, with readings and music as well as a visit to the Vatican Observatory. Click here to see the original BBC web site: http://www.bbc.co.uk/programmes/b01946pc. Click here to access this article as printed in Popular Astronomy (courtesy of Google Books). This book by Marvin Bolt was published in 2009, the year of the 400th anniversary of Galileo’s use of the telescope. It provides a readable history of the telescope by way of highlighting items that are on exhibit in the “Telescopes: Through the Looking Glass” exhibit at the Adler Planetarium in Chicago. Scattered throughout this beautifully illustrated book can be found references to the works of various clerics, such as Bartholomaeus Anglicus (1203-1274), Ferdinand Verbiest (1623-1688), Francesco Bianchini (1662-1729), and others. Those planning a visit to the Adler might enjoy a look through this book in advance. Through the Looking Glass celebrates the 400th anniversary of the telescope and the 2009 International Year of Astronomy. This exhibition catalogue focuses on ninety-nine artifacts from the Adler Planetarium’s world-class collection of historic telescopes. From the simple lenses of the world’s earliest telescopes 400 years ago to the complex computer-driven mirrors of current telescopes, these tools have gathered information about our nearest astronomical neighbors and the most distant objects in the universe. Through the Looking Glass examines this story through select rare books, works on paper, telescopes, and other instruments from the Adler Planetarium’s collection. Introductory paragraphs provide background information for each of four time periods, with each section featuring artifact entries that describe each object’s place in the fascinating history of the telescope. Telescope-makers intended for their work to be looked at as well as looked through. With this catalogue, readers can enjoy the craftsmanship of telescope-making over the centuries, and catch a glimpse of their importance and of the significant discoveries they enabled. Click here for a preview of Telescopes: Through the Looking Glass. Adler Planetarium website for the exhibit entitled “Telescopes: Through the Looking Glass”—click here. It is absurd to presume that God the Architect established these wondrous and precisely regulated manifold motions [of celestial bodies] in vain. It is fitting therefore that we should cultivate the science of these motions… God gave the human race shadows to be schoolmistresses of these things; moreover, he gave us numbers and measures so that we might discern how great a mind has constructed this amazing machine, and so that we should seek and cherish him. Click here to borrow an electronic copy, courtesy of Archive.org. In the spring of 1539, Georg Joachim Rheticus, a twenty-five-year-old mathematics prodigy from Wittenberg, set off on an arduous three-week journey to northern Poland in order to meet the elderly but not-yet-famous amateur astronomer Nicolaus Copernicus. While Copernicus had yet to publish anything on the topic of a new cosmology, rumors had abounded for years about his revolutionary theory (some would call it heretical) that the sun, not the earth, was at the center of the universe, and about a manuscript he had almost completed on the subject. Intending to stay a month, Rheticus spent three years at Copernicus’s side, during which time he sought means—both great and small—of heralding his teacher’s radiant vision of beauty: a cosmology that moved the earth and immobilized the sun. By the early autumn of 1541, the aging astronomer had completed his manuscript, De revolutionibus, and Rheticus persuaded his mentor to let him take it to a printer in Germany for publication. Though no one could have known it at the time, this action changed the course of civilization. Without the intervention of the young mathematician, Copernicus’s seminal work would likely have sunk into oblivion; instead, it ushered in a new understanding of the physical universe, and today is acclaimed as a landmark of scientific and cultural history. The First Copernican is the first popular account of the life of Georg Joachim Rheticus—Copernican muse, founder of modern trigonometry, and champion of new science at the threshold of the modern world. Dennis Danielson’s biography provides a prism through which the dawn of the Copernican Revolution shines in fresh and illuminating ways, revealing the intense curiosity and singular community from which science itself took flight. St. Ephrem, the “Harp of the Spirit,” composed prose commentaries and sermons of skillfull charmand grace, in addition to beautiful hymns, during the time he spent teaching at his native Nisibis and at Edessa in Syria. In the two commentaries presented here, Ephrem focuses only on portions of the sacred text that had a particular theological significance for him, or whose orthodox interpretation needed to be reasserted in the face of contemporary heterodox ideas. He does not provide a continuous, verse by verse exposition. The elaborate rhetorical figures and stylistic devices of the Homily on Our Lord and Letter to Publius succeed in creating language and imagery nearly as striking as Ephrem’s poetry. St. Ephrem’s commentary on Genesis emphasizes that God is the only self-subsistent being and the creator of everything else, and that to take any other position is to make God the “arranger”, and not the “creator”. If we want nonscientists and opinion-makers in the press, the lab, and the pulpit to take a fresh look at the relationship between science and religion, Ronald L. Numbers suggests that we must first dispense with the hoary myths that have masqueraded too long as historical truths. Until about the 1970s, the dominant narrative in the history of science had long been that of science triumphant, and science at war with religion. But a new generation of historians both of science and of the church began to examine episodes in the history of science and religion through the values and knowledge of the actors themselves. Now Ronald Numbers has recruited the leading scholars in this new history of science to puncture the myths, from Galileo’s incarceration to Darwin’s deathbed conversion to Einstein’s belief in a personal God who “didn’t play dice with the universe.” The picture of science and religion at each other’s throats persists in mainstream media and scholarly journals, but each chapter in Galileo Goes to Jail shows how much we have to gain by seeing beyond the myths. Click here for more information from the publisher. Even while he was still alive, Dominican friar Albert of Cologne was widely called Magnus, the Great. His contemporaries said St. Albert simply knew all there was to know; he was a scientist, theologian, and philosopher; a teacher, preacher, and negotiator; a shrewd shepherd and an unflinching defender of the Faith. The time has come to re-discover St. Albert’s greatness, and to profit from his prodigious wisdom and virtue as did his famous student, St. Thomas Aquinas. Author Kevin Vost presents St. Albert’s brilliant scholarly career at the height of the Church’s intellectual renewal in the thirteenth century. St. Albert was tireless (and courageous) in his leadership and works of reform as a Dominican provincial and diocesan bishop. Desperate popes pressed him into diplomatic missions, hoping that Magnus might succeed in making peace where lesser men had failed. These pages not only tell St. Albert’s story they share his lessons. Each chapter uses Albertine teachings, and the witness of the saint’s life, to instruct, edify, and inspire us to greater holiness and more ardent love. Read St. Albert and see why the greatest man of his age has great things to offer our age as well. This book by Owen Gingerich and James MacLachlan is part of the Oxford Portraits in Science series for young adults. The general editor of this series is Gingerich, a historian of science with Harvard University, and an astronomer with the Harvard-Smithsonian Center for Astrophysics. This book discusses both the astronomical work of Nicolaus Copernicus (including some technical detail) and his life as a canon in the Cathedral of Frombork, Poland. Born in Poland in 1473, Nicolaus Copernicus launched a quiet revolution. No scientist so radically transformed our understanding of our place in the universe as this curious bishop’s doctor and church official. In his quest to discover a beautiful and coherent system to describe the motions of the planets, Copernicus placed the sun in the center of the system and made the earth a planet traveling around the sun. Today it is hard to imagine our solar system any other way, but for his time Copernicus’s idea was earthshaking. In 1616 the church banned his book Revolutions because it contradicted the accepted notion that God placed Earth in the center of the universe. Even though those who knew of his work considered his idea dangerous, Revolutions remained of interest only to other scientists for many years. It took almost two hundred years for his concept of a sun-centered system to reach the general public. None the less, what Copernicus set out in his remarkable text truly revolutionized science. For this, Copernicus, a quiet doctor who made a tremendous leap of imagination, is considered the father of the Scientific Revolution.